The Khmer version is out, and we are already considering going back to press! English and French will be back from the printers as soon as possible, and we will also post a list of Cambodian stores that carry the book shortly. International? Send an email to editor [via] siewphewyeung [dot] org [dot] kh. View original art, meet guests from the Cambodian/International comic art scene, see the English, French and Khmer versions of the graphic novel, and witness our “Comic Art Battle”! Our Books and Meta-House invite you to an exhibition of comic art by Em Satya, on November 6th, in Phnom Penh, Cambodia. Em Satya is an artist who has worked in nearly every field of illustration. 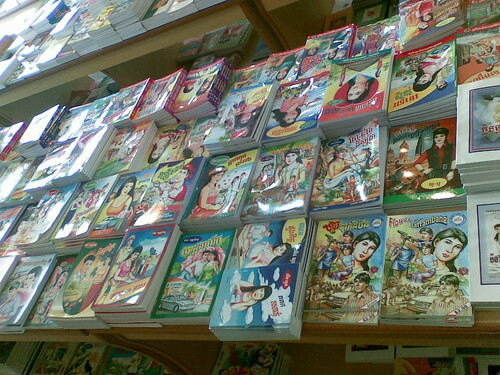 Most foreigners have seen his cartoons as ‘Nono’ in Cambodge Soir, and many Khmer readers have enjoyed his comic adaptations of classics such as Sopaset and Sovannasam. Now, he presents his first comic in graphic novel format, funded with the help of literary aid project VALEASE. ‘Flower of Battambang’ is a graphic novel set in Battambang and Phnom Penh, shelved when the market for local comics experienced a downturn. Nearly two decades later, Em Satya has taken up his pen and finished the story, which has been assembled into one volume. The Exhibition will open on November 6th, 6pm (original art will be on sale). The graphic novel (in Khmer, French and English) will premiere on November 20th. Directions: Street 264 #6, Khan Daun Penh (Near Wat Botum). Click for map. Cheers to CambodiaCIC.info (that’s Cambodia Community Information Centre) for spreading the word and linking to Life’s Choices! Life’s Choices (Khmer version) has just come back from the printer! More news to follow.